Among all the topics discussed during the Vehicle Dynamics and Control Seminar hosted in Cambridge last year, there was one issue the delegates seemed unable to agree upon. The handling limits of virtually all road vehicles are dictated by the tires, how much force they are able to generate in different conditions in the longitudinal and lateral direction. I will not go into how these forces are generated, but we can visualize their characteristics in these two plots from OptimumTire. 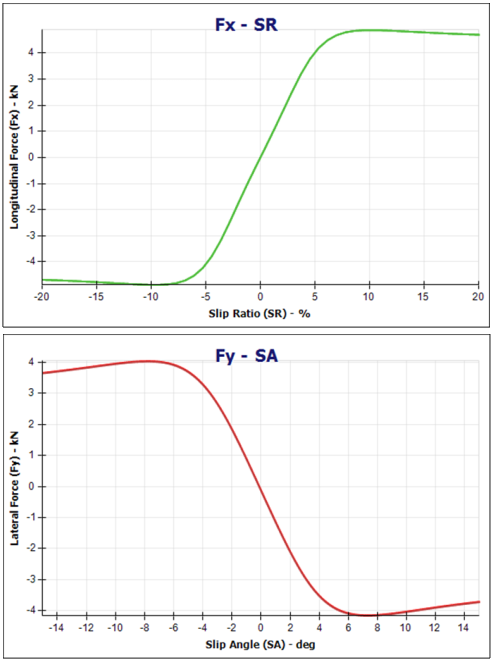 We can see how both the lateral and longitudinal forces peak at a certain slip angle and slip ratio, respectively. Before reaching this peak, the tire is fairly linear in its response. Beyond this peak, the tire is unable to generate a higher force, the tire is saturated. When we look at the full vehicle in an extreme handling maneuver, for example an evasive maneuver, at some point one of the four tires will reach its peak and will become saturated. When this happens and to which of the four tire, depends on partly the maneuver itself, partly on the vehicle setup. In the same way as the tires saturate, the vehicle’s response to the driver’s inputs also saturates, we can say that the vehicle has reached its limit. During emergency maneuvers, drivers will leave the everyday, linear, part of this curve. In an emergency, the vehicle will not respond as the driver is used to; turning the steering wheel 10% more might only make the vehicle turn 2% more. This change in behavior can reduce the driver’s chances of successfully carrying out the maneuver. On the other hand, this saturation will help the driver to notice when the limit is reached. With future drivetrains, new possibilities open up in terms of chassis control. Most vehicles sold today have some sort of ESC (Electronic Stability Control), which helps the driver in tricky situations. Most of these systems rely on applying the brakes on one or more wheels to control the vehicle. In electrified drivetrains, the possibility of both braking and accelerating individual wheels becomes feasible. Depending on the control strategy used, vehicle dynamicists will face a problem. 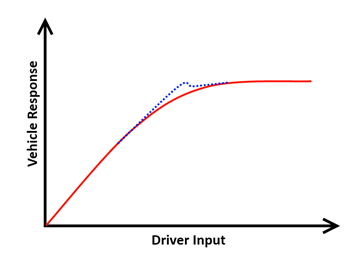 Either they can setup the vehicle and control strategy to keep an Input/Response curve, which slowly reaches it maximum. Or they can extend the linear region, but with a more abrupt saturation as a result. The benefit of an extended linear range is that it will make the vehicle respond the same way in extreme situations as it does in normal driving. This can possibly help the average driver to avoid an accident. On the other hand, when the vehicle reaches the limit, there will be less of a warning and the vehicle’s response characteristics will abruptly change. Is it a good idea, extending the linear range, where most drivers are able to predict the vehicle’s response, but with a more abrupt change once the limit is reached? What do you think – discuss in the comments below! 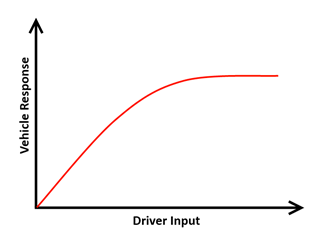 ← Has video killed data acquisition?